Would you like to know how much the service life of an LED luminaire differs in other ambient temperatures? Or how much longer the service life of an L80 LED luminaire is under L70 conditions? This TRILUX LIFETIME calculator enables the nominal rated service life (consisting of luminous flux reduction and hours) and the ambient temperature to be converted. One manufacturer gives you a service life in hours under L80 at 25°C, another specifies in L70 at 35°C, and a third manufacturer only specifies L70 without any temperature (25°C then applies). Which luminaire is better or has the longer life, and in which ambient temperature? 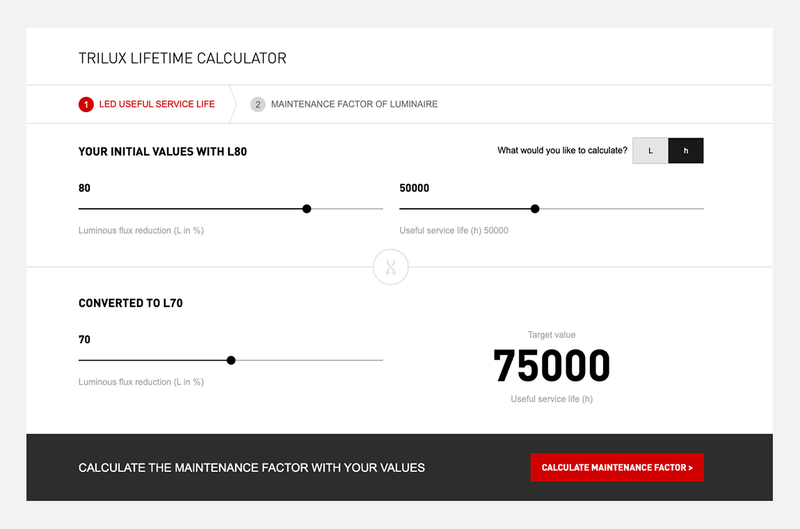 This small online tool can convert these service life specifications for you. Convert an L80 luminaire to an L70 and vice versa. 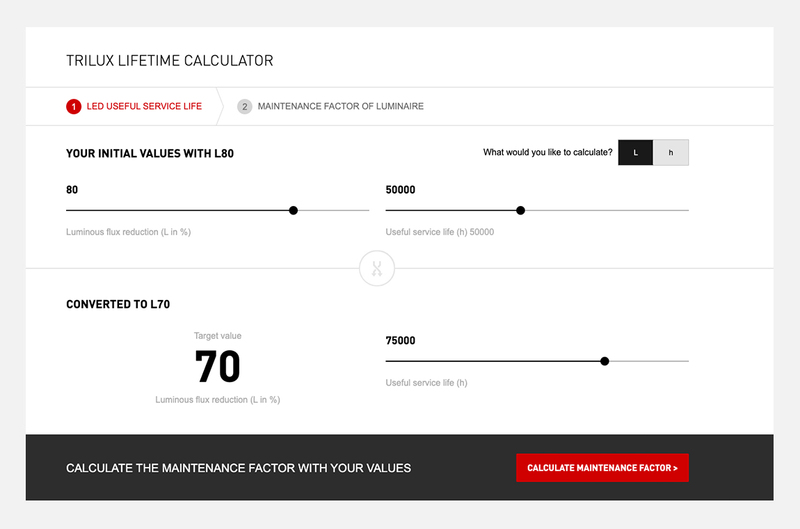 With your service life specifications, the TRILUX LIFETIME calculator can determine the maintenance factor in a second step. For this purpose, simply enter the selected maintenance interval (e.g. an office with 30,000 hrs.) to get an individual maintenance factor. As part of this the luminaire luminous flux maintenance factor (LLMF) and lamp survival factor (LSF) are calculated directly. The luminaire maintenance factor (LMF) and room maintenance factor (RMF) must be entered manually. If the luminaire or connected light management system supports constant luminous flux technology (CLO), the result also outputs a performance service life factor (PLF). Service life: Calculation of service life specifications (L, service life in hours, ambient temperature) from an original luminaire to a recalculated/converted luminaire. 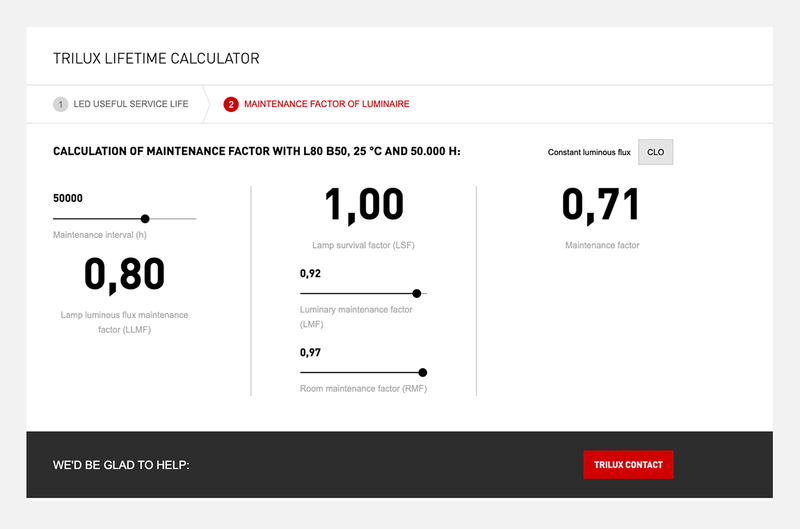 Maintenance factor: Calculation of the maintenance factor for the specific luminaire service life specification by using an individual operating duration or the maintenance interval. 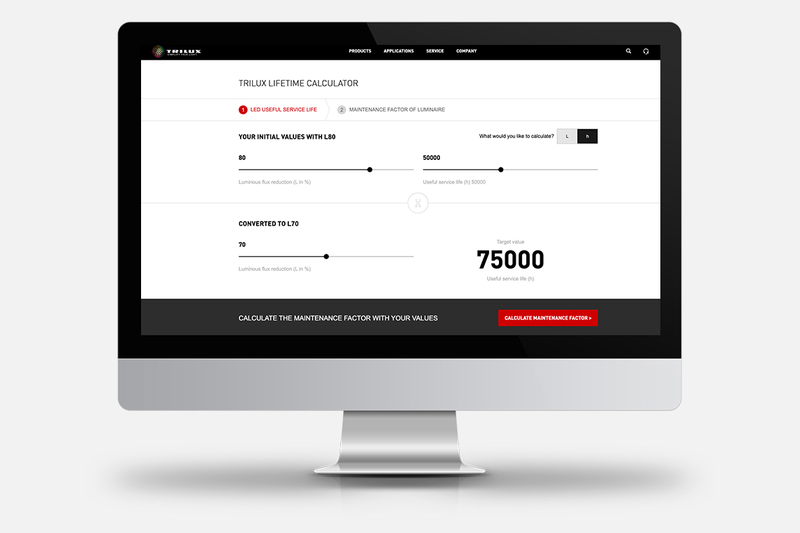 Simply log on or register with the TRILUX Portal and use the TRILUX LIFETIME calculator.